Want to get some exercise and learn about health issues that affect you? 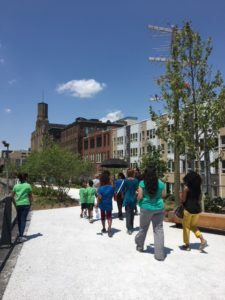 Then join the City of Philadelphia Department of Public Health for their third “Walk with a Doc” on every second Wednesday, at 12 noon at the Municipal Services Building, in front of the iron statue. During this free monthly program, you can enjoy a walk with an area doctor who provides support and answers questions during the walk. You will be joined along on the walk with other local professionals from neighboring organizations in the city. At this month’s walk, the City of Philadelphia’s Department of Public Health Director of Chronic Disease Prevention and family physician, Cheryl Bettigole, MD, will provide a brief presentation on tips for healthy eating. Take a step towards a happier, healthier you and join the City of Philadelphia Department of Public Health to Walk with a Doc, every month on the second Wednesday at 12 noon outside of the Municipal Services Building (1401 JFK Blvd Philadelphia, PA, 19102). Walks will take place every second Wednesday of the month, at noon, if there is no inclement weather. For more information on our walk group please click here. Feel free to spread the word and bring a friend. Hope to see you there!